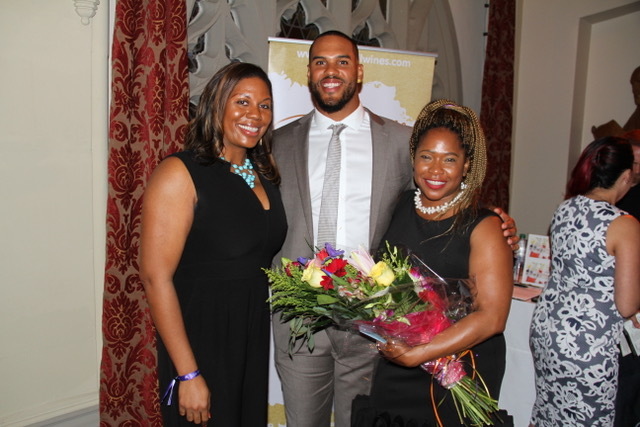 (Los Angeles, CA) –LA native, UCLA All-American, 3X NFL Pro-Bowler, and starter from the top-ranked Minnesota Vikings Defense, Anthony Barr, officially launched the Raise the Barr Emergency Grant Fund for Single Parent Undergraduates at the Second Annual Perfect Pairing Wine Tasting Fundraiser on June 27, 2018 at Loyola High School’s historic Rupert Hall courtyard in Los Angeles, CA. During the evening, guests enjoyed wine donated from Black and Women-owned wineries and delectable bites from Discover Jewels, a Black Female owned catering company. Nearly $50,000 was raised through sponsorship, ticket sales, and once-in-a-lifetime silent auction items. Anthony established Raise the Barr in 2016 to help break the cycle of poverty for single-parent families by providing access to post-secondary education. In addition to the new LA Emergency Grant Fund, RTB has funded Emergency Grants at the Jeremiah Program Twin Cities and the University of Minnesota. In Los Angeles, Raise the Barr will work with the following nonprofits to award Emergency Grants to single parent undergraduate students in the Los Angeles area: UCLA Students with Dependents program, Jenesse Center for Domestic Violence Intervention and Prevention, Santa Monica College, and Upward Bound House for homeless families. Research has shown that unexpected events such as a car breaking down or a childcare worker getting sick, are often enough of a financial obstacle to prevent single parents from continuing their post-secondary education. Raise the Barr Emergency Fund grants will help students address these unexpected expenses and stay in school. Loyola High School was also the location for this year’s Raise the Barr free football camp through USA Football. On July 16, more than 160 youth, ages 8 – 13, attended the FUNdamentals camp, which included one on one interaction with Anthony Barr and his college and Vikings’ teammate, Erik Kendricks, among various other coaches. Over 50 volunteers were in attendance to support the day. FUNdamentals incorporates a series of drills to teach passing, catching and running skills in a non-contact setting. All skills and drills selected are based on USA Football’s Player Progression Development Model, ensuring children are learning in an age-appropriate manner, based on their cognitive and physical maturity. In addition to the Emergency Grants and the Football Camp, Raise the Barr provides tuition and childcare scholarships to single parent undergraduates in California and Minnesota. The 2018/2019 Raise the Barr scholarship application is available online at www.RaisetheBarr.org from now until November 15, 2018, when the cycle closes.